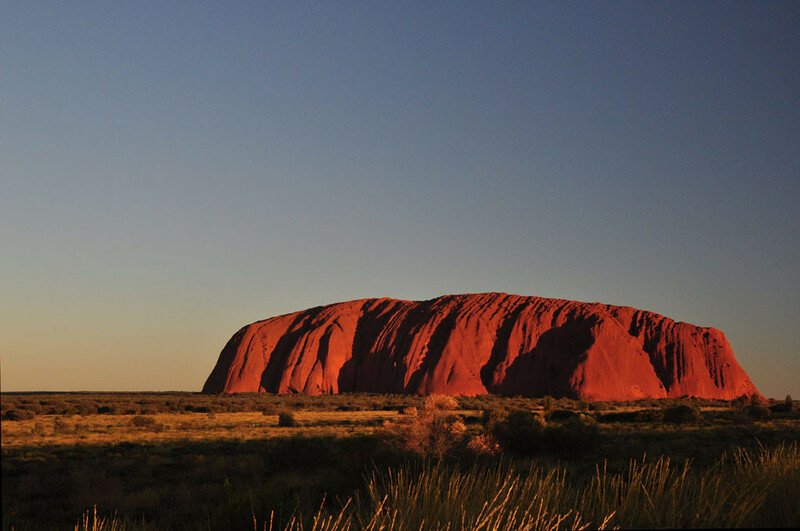 Looking at a map of Australia, Sydney - Melbourne - Uluru looks like a natural triangle. Looking at a flight plan, it looks more like the Bermuda Triangle. 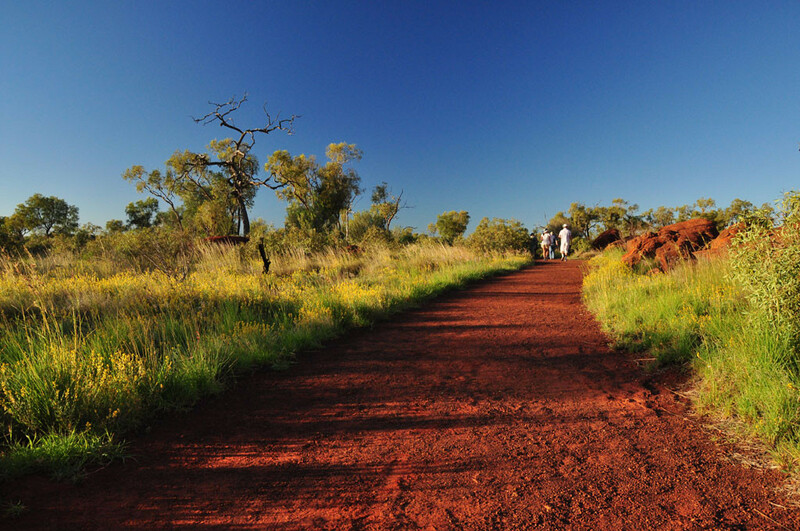 There are flights between Melbourne and Alice Springs, and there are flights between Sydney and Ayers Rock Airport, but there are no flights from Melbourne to Ayers Rock or from Alice Springs to Sydney, and no tours that will start at one and end at the other (though Adventure Tours did finally start doing just that in January). 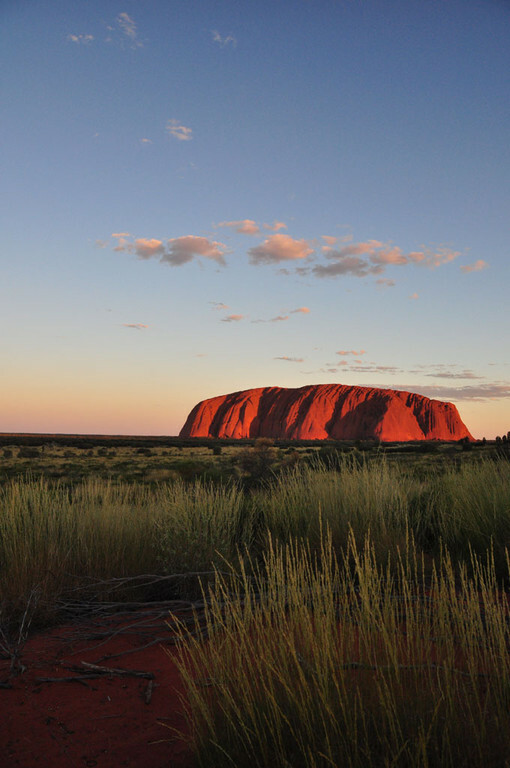 Since we needed to get back to Sydney after Uluru, we had to get up at 4:00 a.m. in Melbourne to catch a 6:00 flight back to Sydney, then take another flight that would get us to Ayers Rock a little before noon. 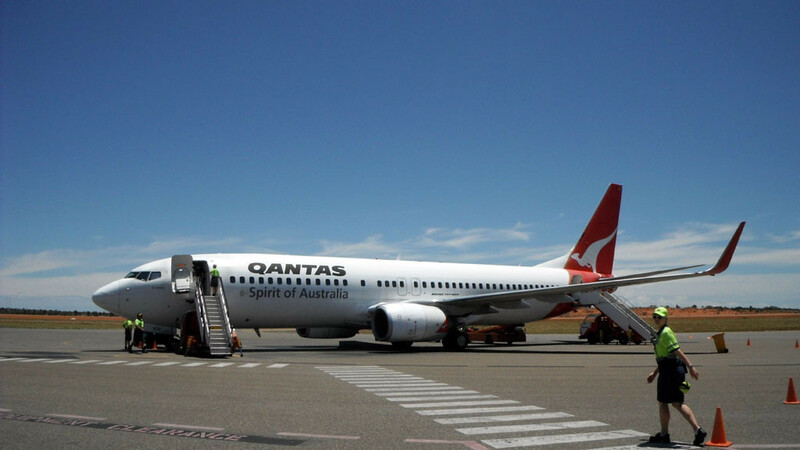 Thanks to Quantas, at least this time our baggage would be covered. 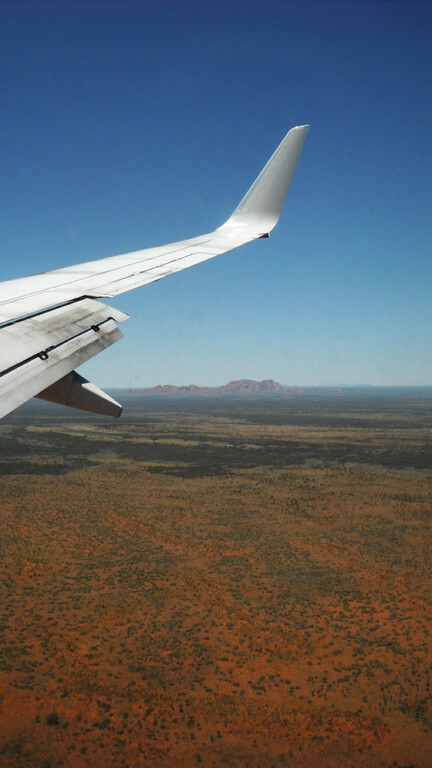 Flying west over central Australia is like watching the Earth slowly transmogrify into Mars. At first you are treated to the greenery of the Blue Mountains, the uniform height of which makes them look oddly like brain tissue flattened over the landscape. 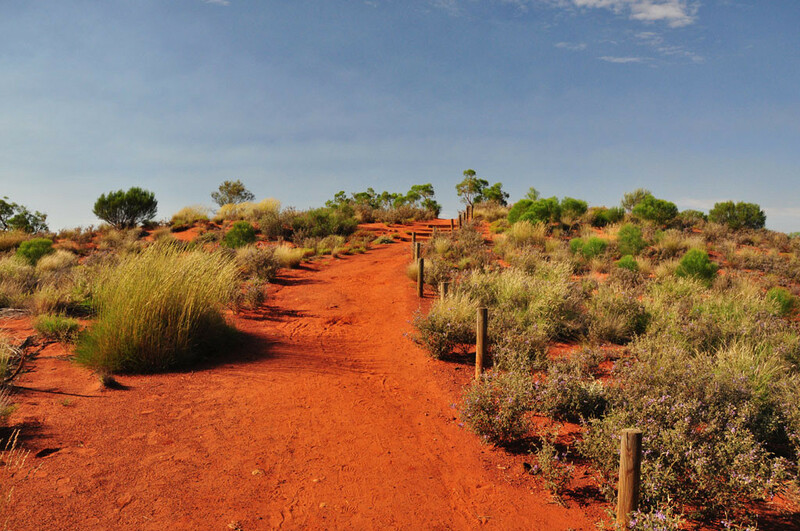 Beneath the foliage the ground gradually turns a parched desert brown, until at last the trees disappear to reveal a landscape of parallel narrow ridges, like jagged red lines scratched into the earth by a vindictive thousand-fingered god. 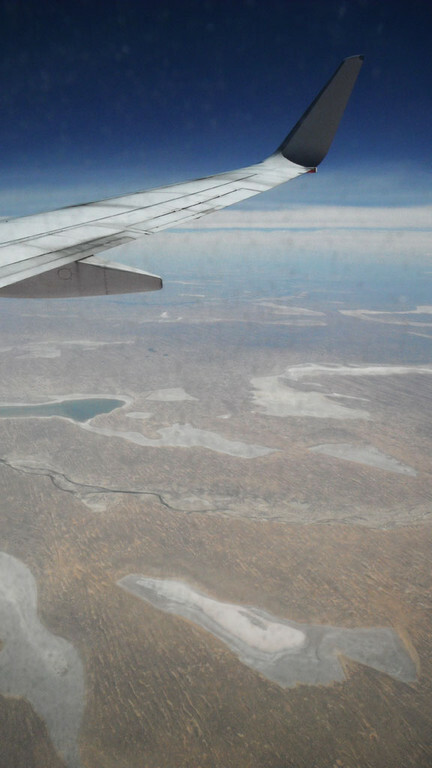 As the ridges subside, massive salt lakes appear, only one of them partially filled with inert water of aquamarine blue. 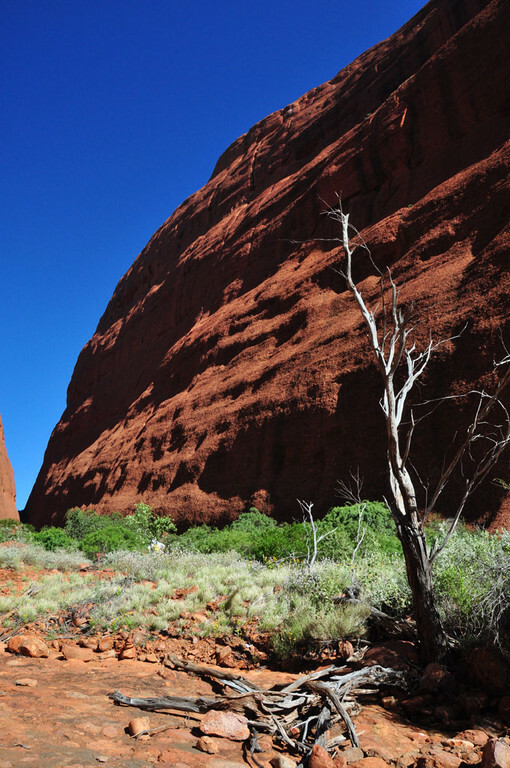 Vegetation begins to return upon the approach to Uluru, each tree surrounded by a 10-metre radius of isolation, the vegetation below a vivid Emerald City green against the red ochre of the earth. 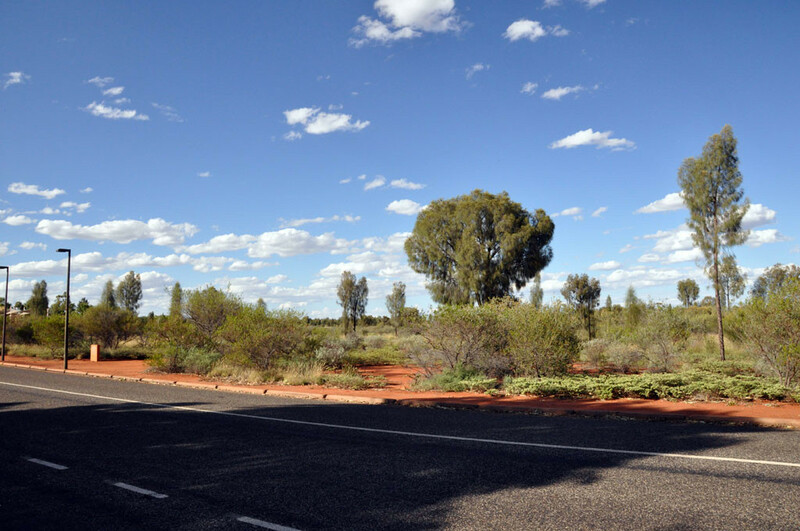 The Central Australian time zone is 30 minutes back from Eastern Australia, while Western Australia is 90 minutes back from Central. 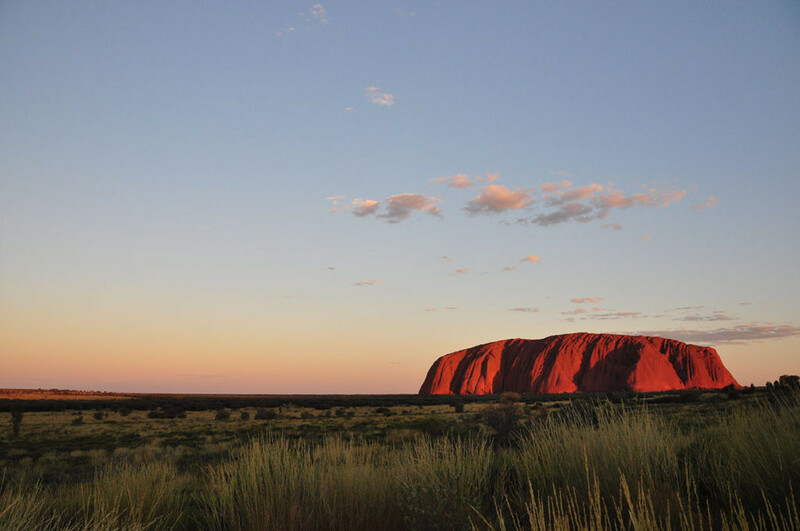 Then there’s daylight savings time, which is only observed in Australia’s southeastern quarter, meaning that, at the time we went, Ayers Rock was 90 minutes behind Sydney time, and I’m no longer sure what time it was when we arrived. The important detail is that the airport is only 10 minutes from the resort, and shuttles are automatically timed to match with the few daily flights. 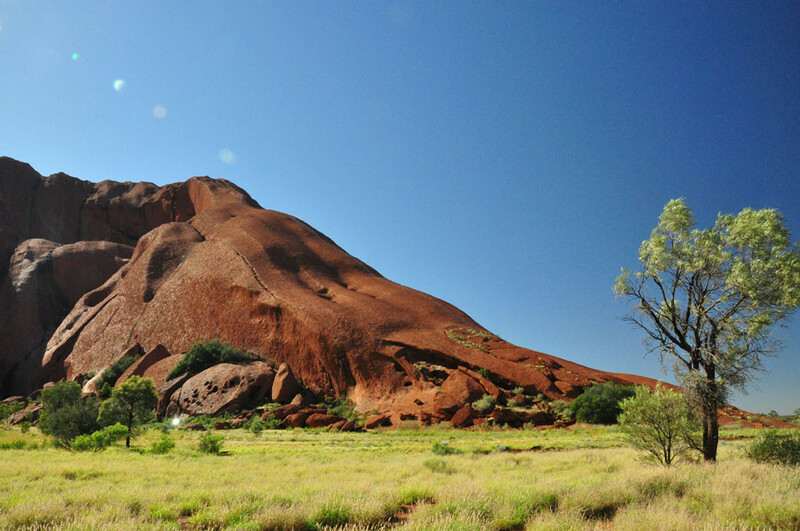 Ayers Rock was named after Sir Henry Ayers, Chief Secretary of South Australia in 1873. 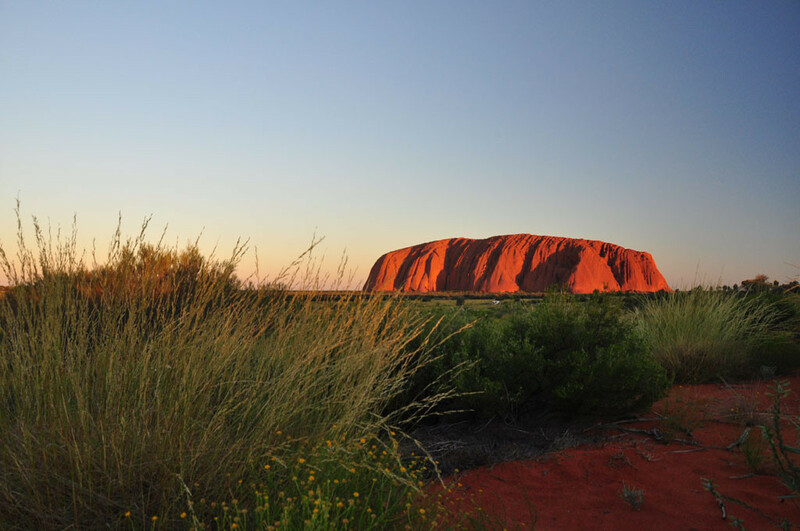 In the local Anangu language it is known as Uluru (“OOlu-RU”, not “oo-LU-ru” as I tended to pronounce it), but both names are officially recognized without distinction. 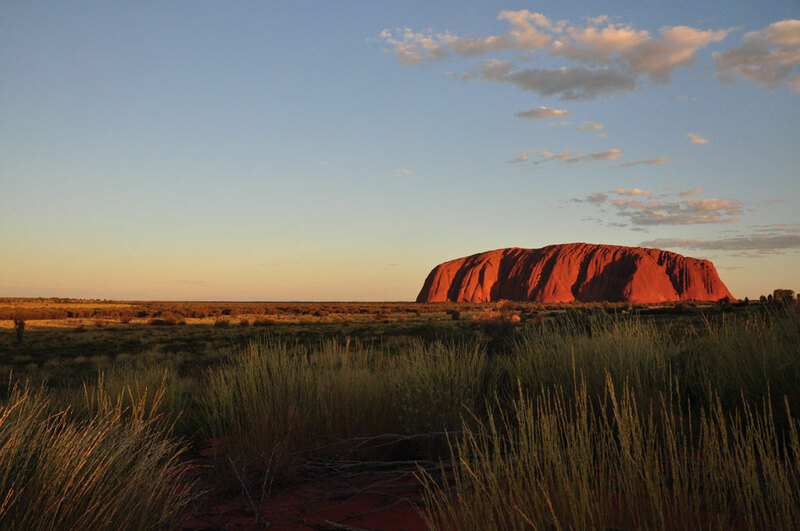 Students of Japanese may find it interesting that the Anangu language frequently uses hard “n” and “tch” sounds (the latter written as “tj”), and features a fairly consistent vowel-consonant phonetic pattern, with verbs coming at the end of each sentence. I wonder if these are hallmarks of a proto-language that was gradually overtaken by newer languages in all but the most remote regions. 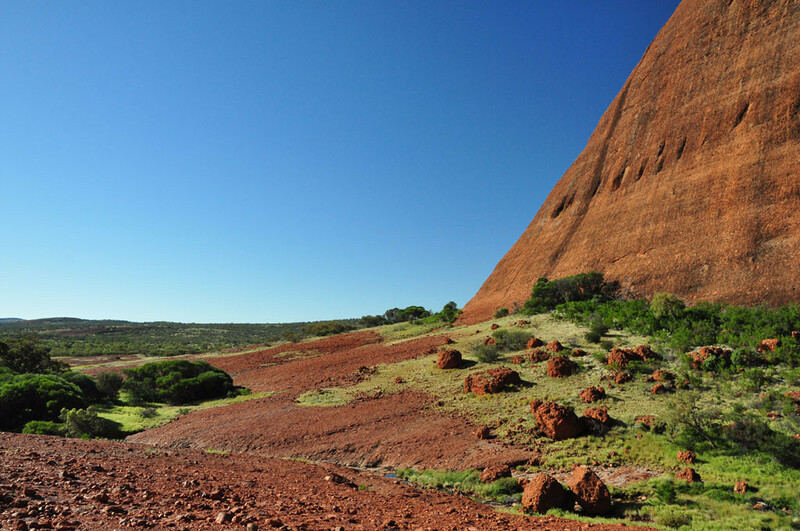 Uluru stands in Uluru-Kata Tjuta National Park, an area of 1,325 square kilometres that is registered as both a natural and cultural UNESCO World Heritage Site. 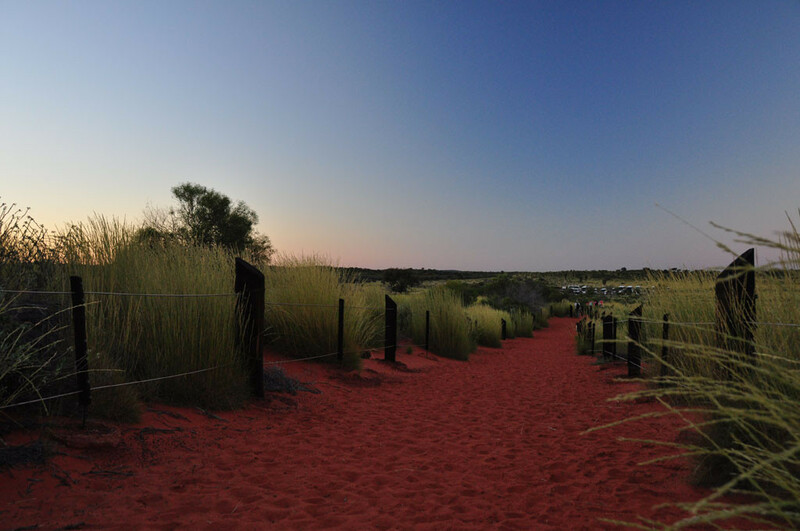 The park was returned to Aboriginal ownership in 1985, and is administered by a Board of Managers consisting of eight Aboriginal and four non-Aboriginal leaders, with day-to-day management handled by Parks Australia. 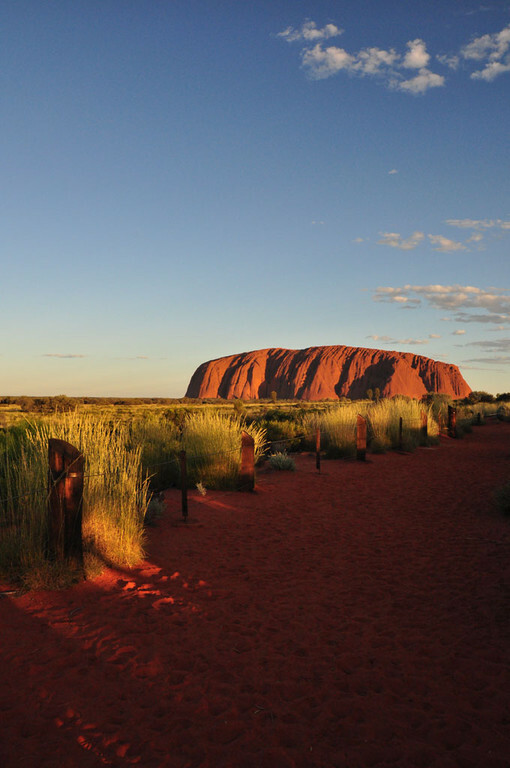 Despite being mapped by Europeans in 1873, Uluru only became a tourist destination in the late 1930s, with the first roads developed in 1948. 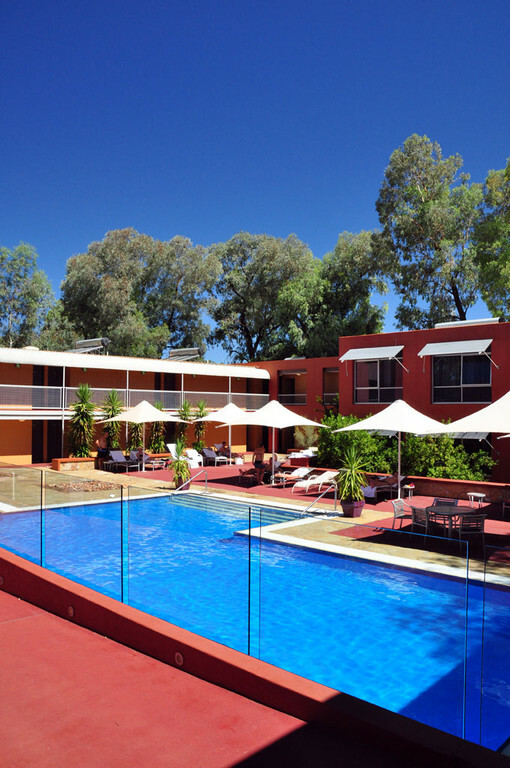 By the 1950s a motel and airstrip had been built in the shadow of the rock, but in 1975 these were replaced by facilities in the newborn tourist town of Yulara, now known as Ayers Rock Resort, which was established just outside the borders of the national park. 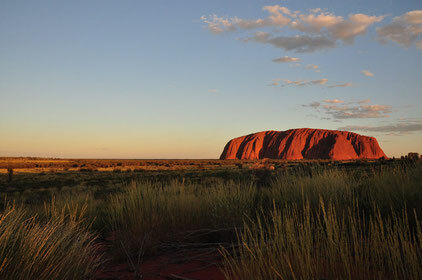 Roughly 3,000 people now inhabit the town, all of them temporary residents from other parts of Australia. 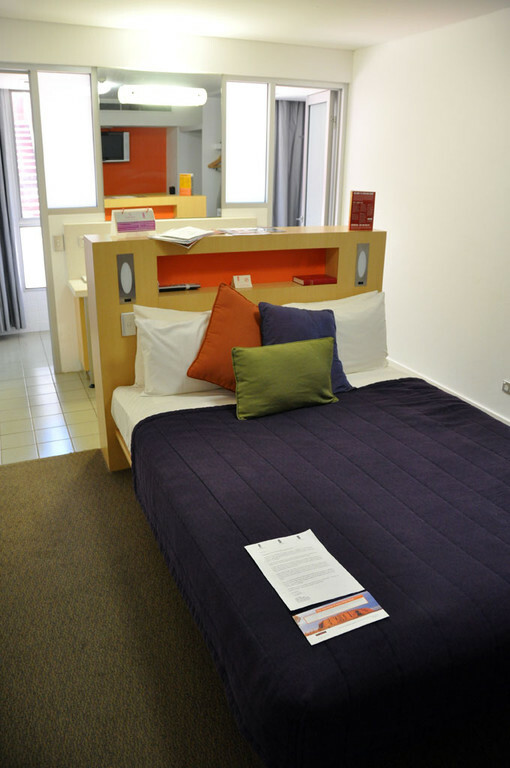 Most go home after 2-3 years, with a three-year resident being considered a “local”, while some who get into the Aboriginal culture may come back for multiple tours. The mentality reminded me very much of ALT life in rural Japan. 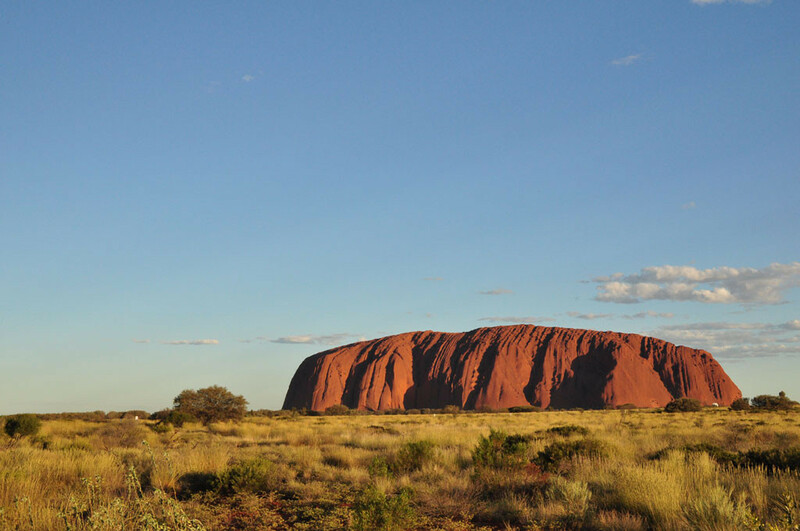 The rock is 9.4 kilometres in circumference (resort residents jog around it in the morning) and 348 metres high, representing the exposed tip of a massive slab of sedimentary rock that has been folded upward at an 87-degree angle. 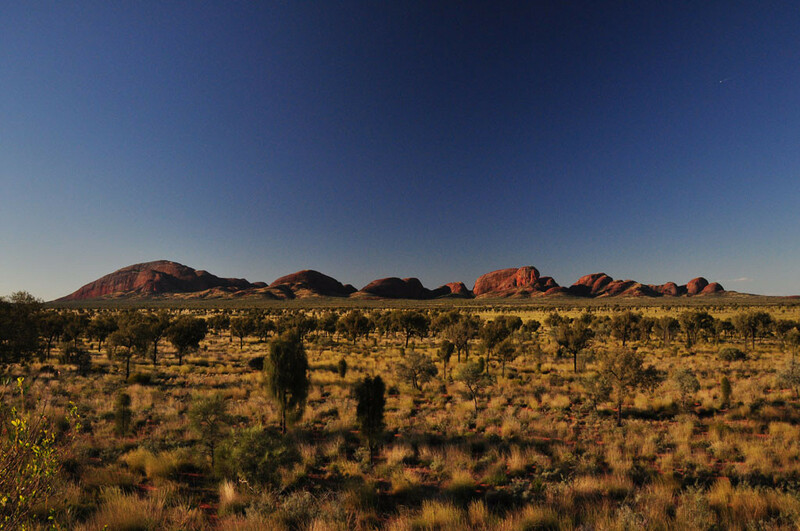 The other end of the slab is Kata Tjuta, also known as the Olgas, a collection of 36 conglomerate domes some 32 kilometres to the west, the tallest of which is 500 metres high. 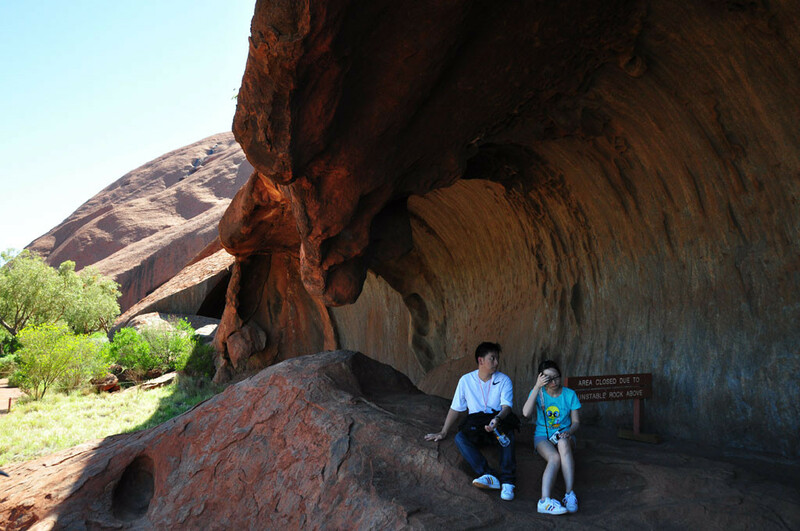 The huge underground slab acts as a natural reservoir that now feeds the tourist town, while feldspar in the rock oxidizes to generate the characteristic red colour of both the sand and stone. 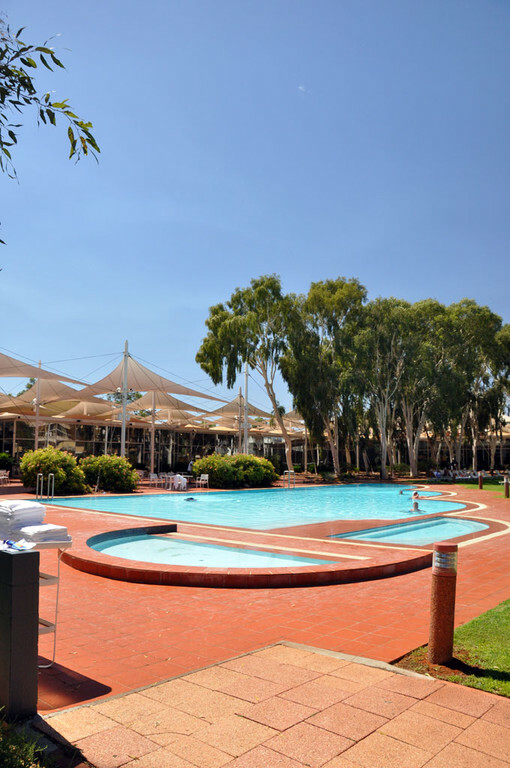 In addition to campgrounds, there are four hotels at Ayers Rock Resort, each catering to a different economic class: lodge-style, moderately expensive, notably expensive, and We Have An Art Gallery In Our Lobby, Would You Like To Buy Some? We stayed at the Lost Camel, the “moderately expensive” option, which meant we got a ridiculously lavish pool, but had to go to one of the other hotels if we wanted to eat. Our room had blandishments that might have been stolen from a Japanese love hotel: a massive TV, a stereo, a couch, a bed right in the middle of the room, no table, and an air conditioner blasting sub-zero temperatures even at the weakest setting. The resort hotels are all connected on a single loop road. The longest walk between them is about 15 minutes, though the less fit are still offered a shuttle bus. The shopping centre turned out to be the best bet for food, and here we grabbed an Asian-style dinner from the unfortunately-named Ayer’s Wok for just $7—by far our cheapest meal over ten days in Australia. While the hotel happily offered us a $20 “breakfast box” to bring on our early-morning tour the next day, we easily found superior fare at the local grocery store for a quarter the price. It was, however, a little surreal to hear Frosty the Snowman and White Christmas on store speakers under 30-degree heat. 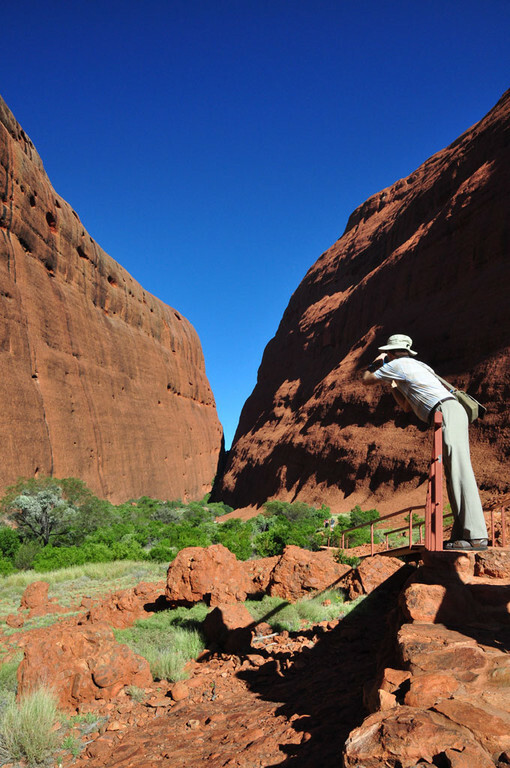 A three-day pass for the national park is $25—generally included in the price of any tour—and while the guides claim that these passes are stringently checked, park security involves no more than holding up your pass and waving it from the bus window as you drive by the gate. 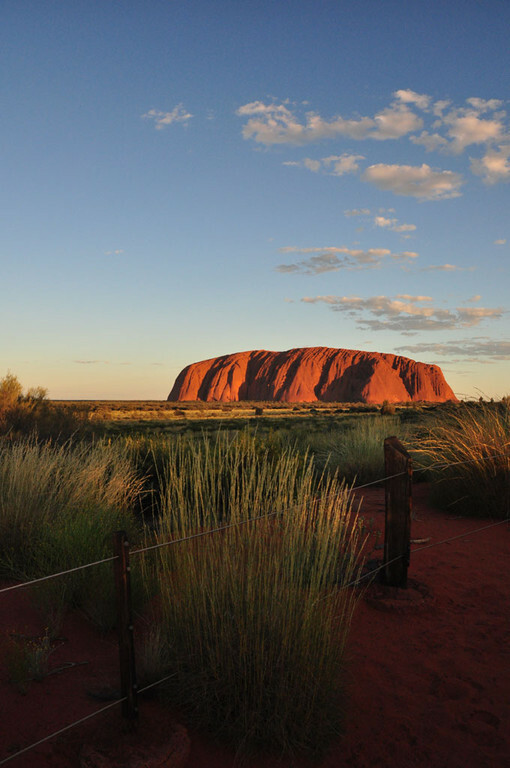 We drove the fifteen minutes or so to Uluru, where the first order of business for our bus driver was to set up a refreshment station. 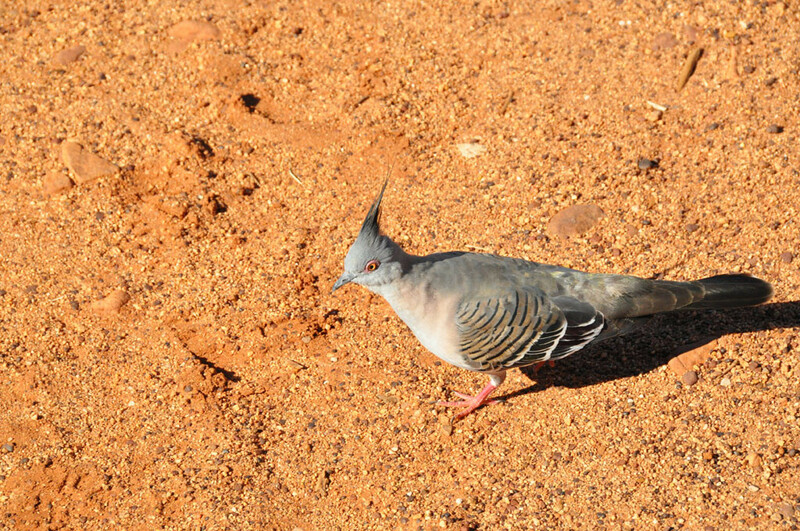 I ended up carting a folding stool, my camera, my tripod, a cup of mixed nuts and a glass of wine about 500 metres down a red-sand path, feeling like I only needed a parasol to complete my portrait as The Clueless Colonial. The excessive pampering was almost dehumanizing. Then again, given the temperatures we would face during the day, I quickly decided I was very happy we had not opted for the backpacking tour. Our sunrise tour came to pick us up at 4:30 the next morning. It was cool enough to need a jacket, but it would get up to 38 degrees during the day. 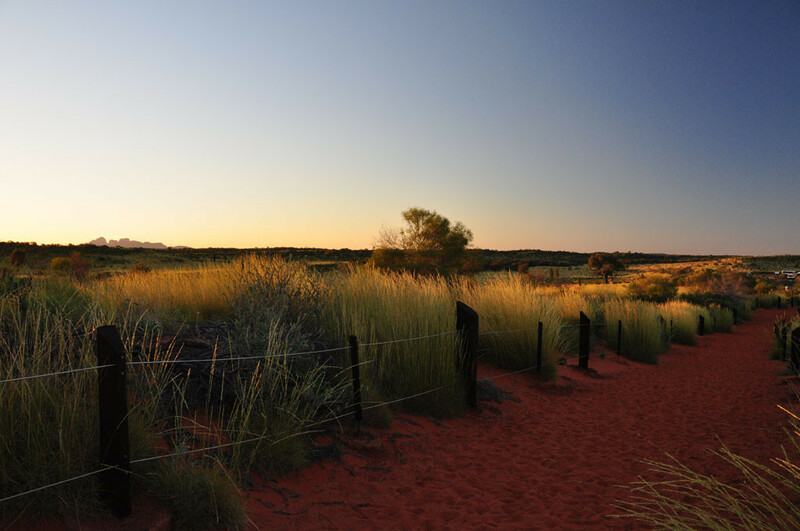 While the sunrise facilities on the eastern side of Uluru are rather impressive—a series of raised platforms and walkways—the sunrise itself is not nearly as picturesque as the sunset. 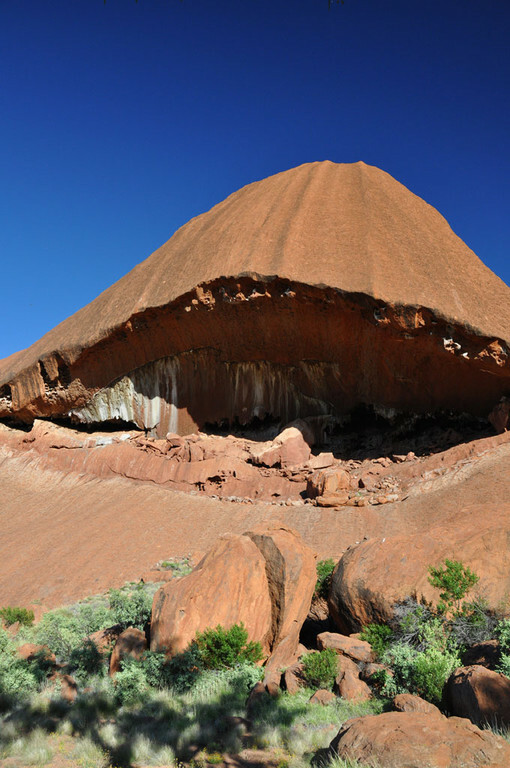 However, the eastern side of Uluru is far more geologically interesting, and here you can see the first hints of the various caves and eroded holes that mark the surface of the rock, all flaked off like pieces of clay. 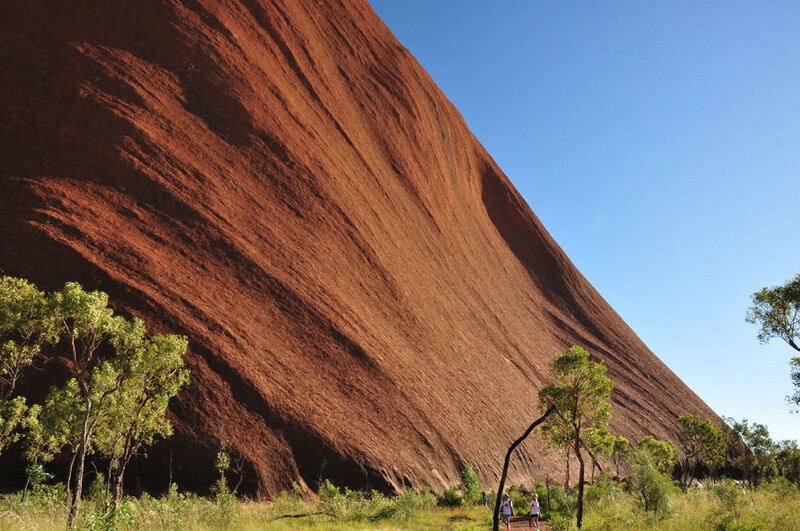 The vertical lines on Uluru are not striations, but a result of erosion. It had even rained for the three days prior to our arrival, and there was water still trickling down in several areas. 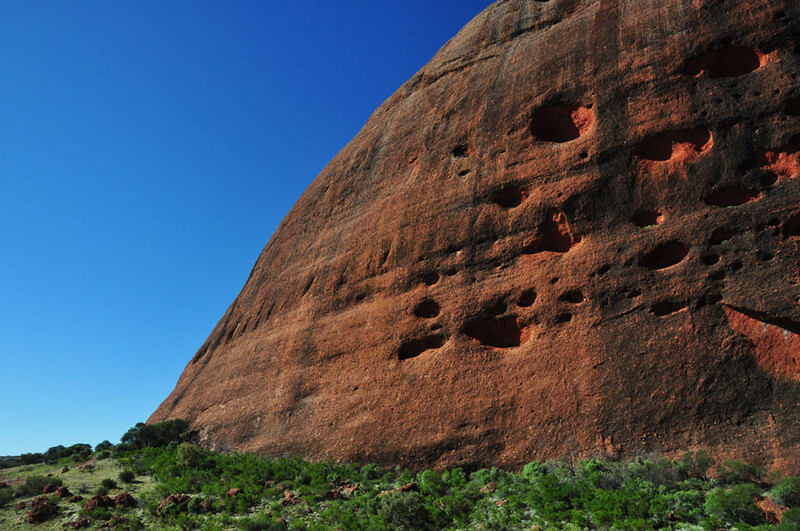 We were taken to select points around the circumference of the rock, walking little more than an hour at each location before being picked up by the bus and taken to the next stop. 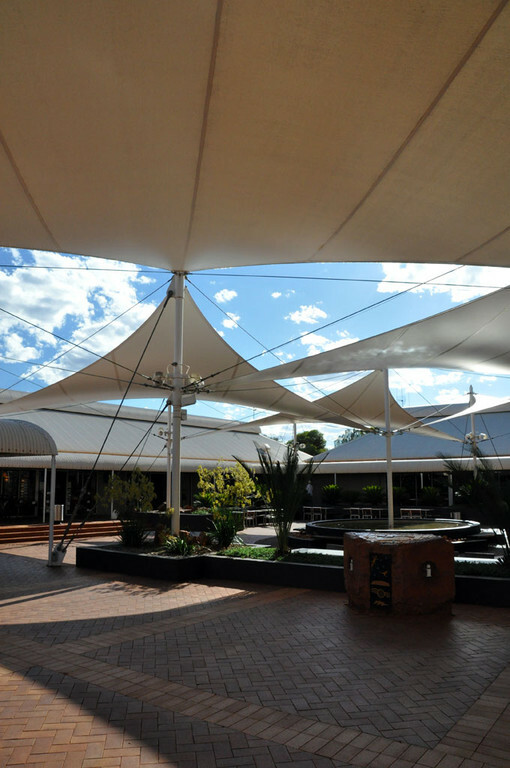 Certain locations were defined as “culturally sensitive sites”, where photography was not permitted. We learned that the “photos steal your soul” concept is actually a simplification—it is, rather, believed that there is an inherent spirit both in people and in certain places, and that by taking a photograph, a part of that spirit is trapped and carried away, thereby weakening it. 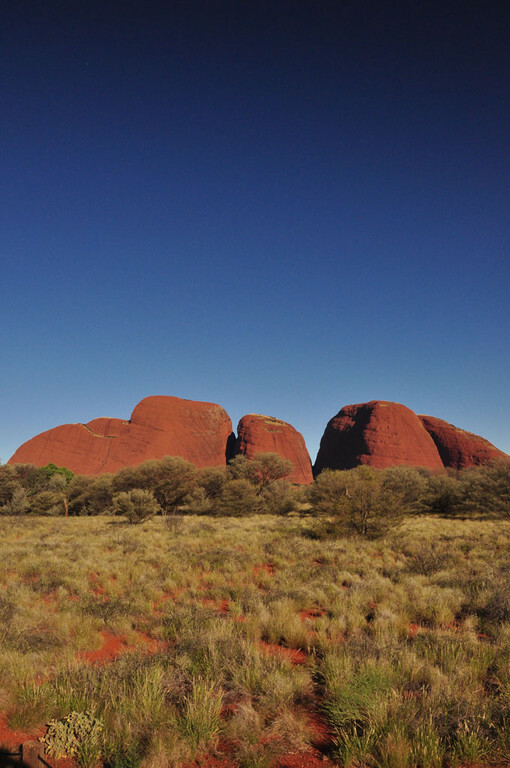 The Western guides were remarkably knowledgeable and dedicated to understanding of Anangu culture, but it was interesting that their knowledge was limited to the local, with little awareness of global precedents. 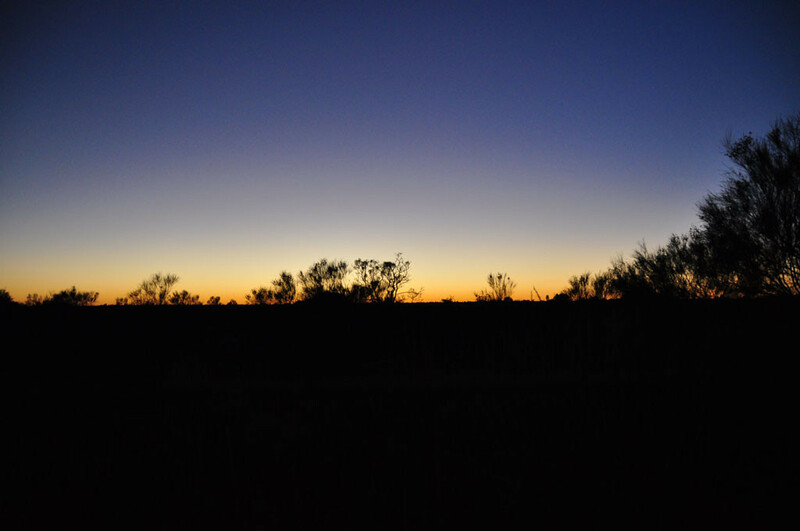 For example, we were told that some Aborigine groups have a tale of a Sun-woman and a Moon-man, with the woman forever seeking the man in the sky. Not only does this compare to the Tanabata tradition in Japan (which is itself an adaptation of a Chinese story), but it is a fascinating counterpoint to ancient Greek belief that ascribed the moon to women due to the similarity of their monthly cycles, while the sun-god was associated with the male (and was, incidentally, sacrificed annually just as the sun goes down day by day—until Zeus the immortal male showed up and put a stop to all that). 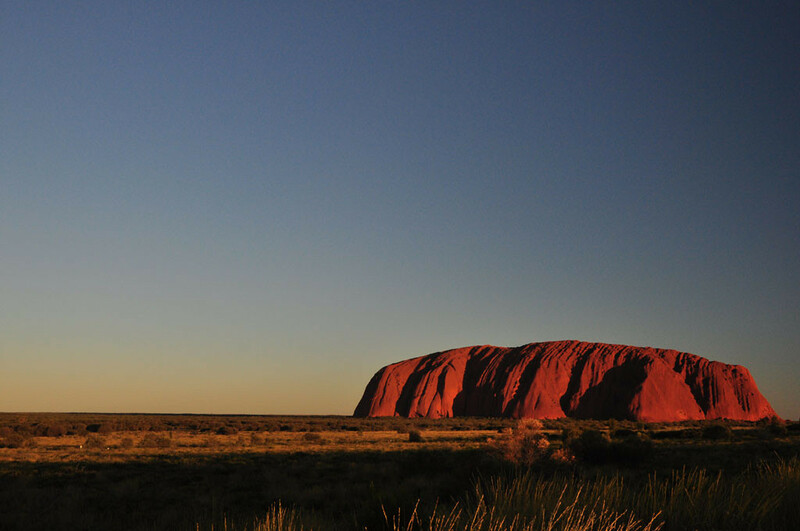 Though it has sometimes been said that “Uluru” means “meeting place”, it is in fact just a name—though with five permanent water holes, it certainly does serve as a vital gathering place for the Anangu people. 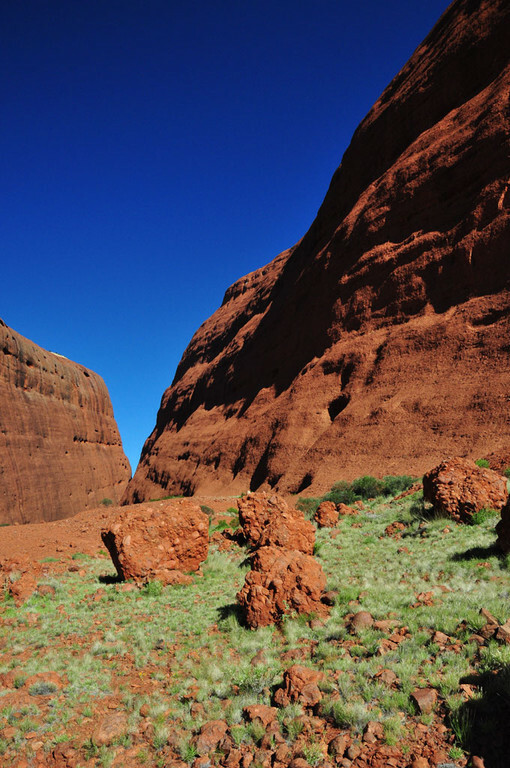 The Anangu have been living in the area for 22,000 years. 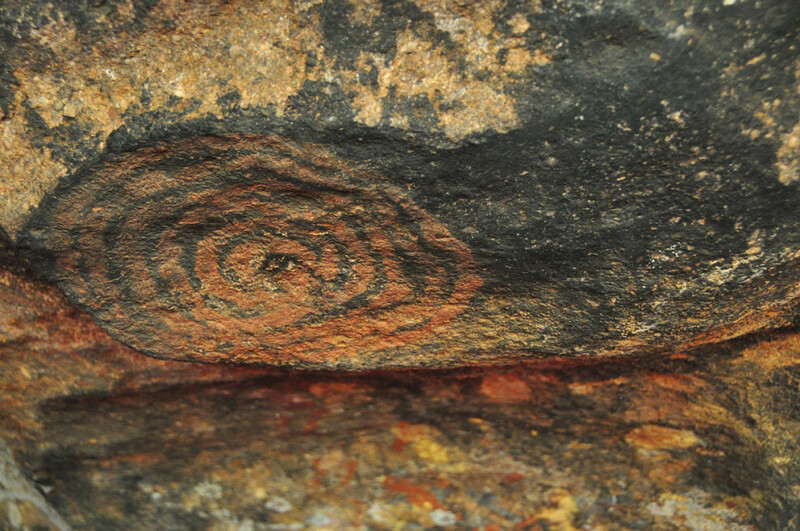 This means their culture predates that of the Sumerians—and they are not nearly the oldest Aboriginal group in Australia. 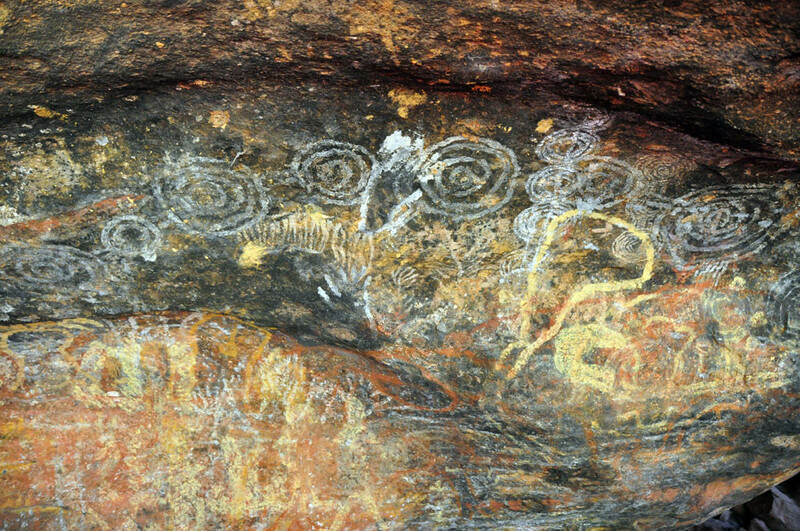 They believe in creational beings called tjukuritja (pronounced by our guides as “chu-kuREET-cha”), anthropomorphic demigod-like creatures whose actions left marks on the landscape. 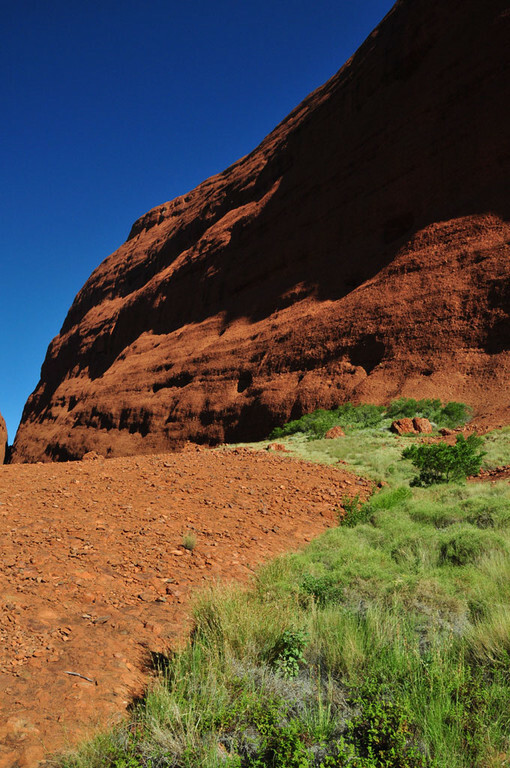 Every feature of Uluru tells a story, from the eroded area that looks like an emu’s thigh stabbed with a spear to the dark stain down one side that represents the burnt skin of the thief who stole and ate it. A pair of clefts with rust-coloured stains are the wounds inflicted by Kuniya the python-woman on Liri the snake-man, and a round rock close to a waterhole is his fallen shield—again fascinating, because serpents and dragons are associated with water worldwide (I always wonder if this is due to dinosaur bones being discovered in areas of rapid erosion), and the guides told me that there were tales of serpent-guardians of water holes among other Aboriginal traditions as well. 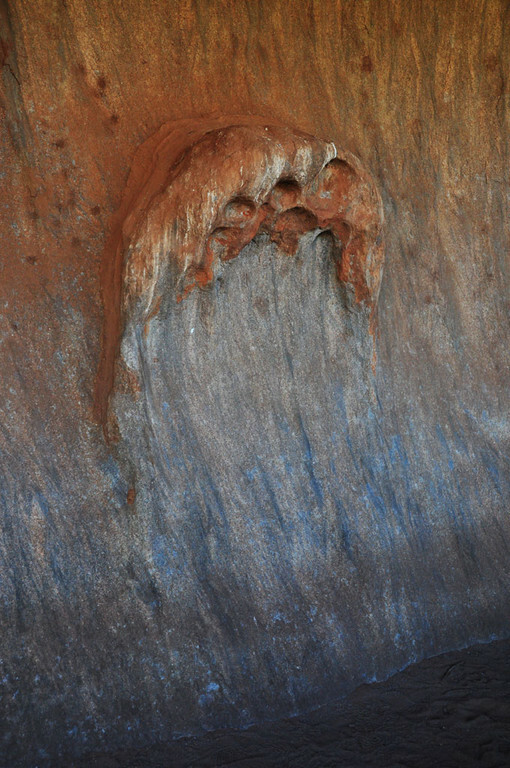 One of Uluru’s more elaborate stories is that of Kurpany the demon dingo-dog, depicted as a Totoro-like black blob in several cave paintings. 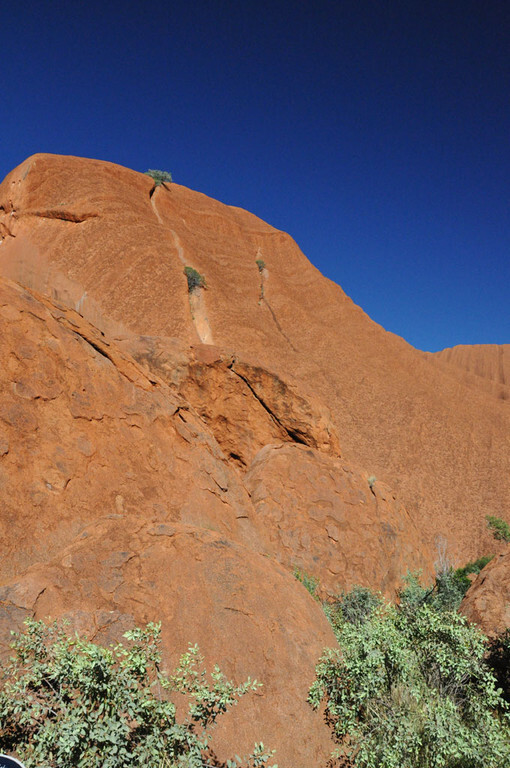 His footprints can be seen along one side of Uluru’s base, while the face of the Mala wallaby-man who sacrificed himself so that his people could escape the demon’s wrath is etched into the rock face above. The guides took the stories very seriously. It is only by oral tradition that they are passed down, so they must be recounted without error. Each story has multiple meanings, with only the simplest, parable-esque levels being shared with Westerners—and even these may be made up just for us. 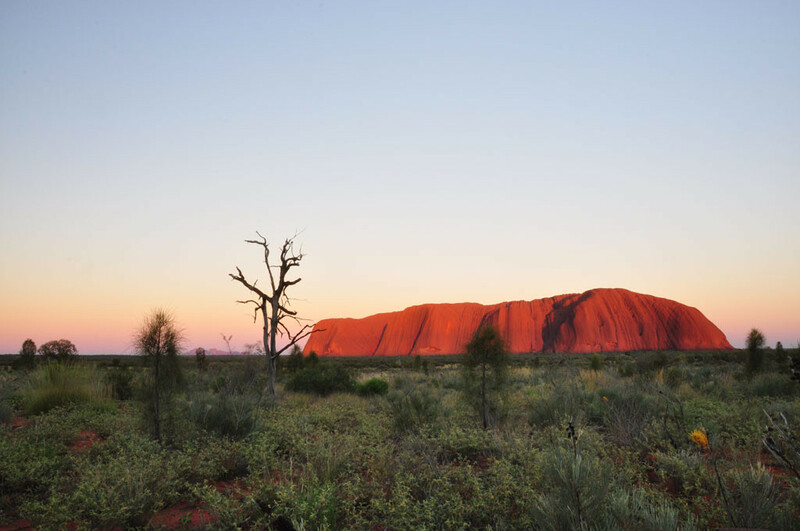 To learn the deeper meanings, one must become initiated into Anangu society—which, for men, involves knocking out one’s front tooth, circumcision, and the carving of detailed patterns into the torso and arms, all with the same quartz stone. 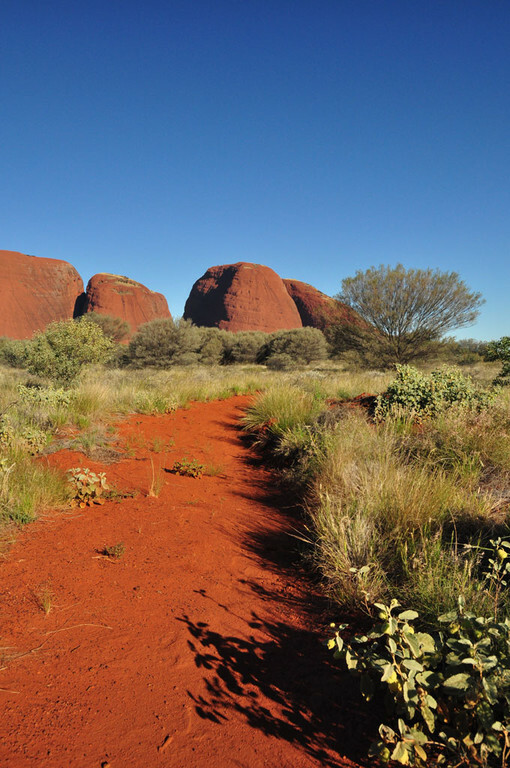 While the Anangu still exist today—roughly 120 live on the park, and their members are part of the management board—their numbers are much reduced, and Western farming and technology have altered the tightly-balanced regional ecological cycle to the extent that their traditional way of life is no longer possible. 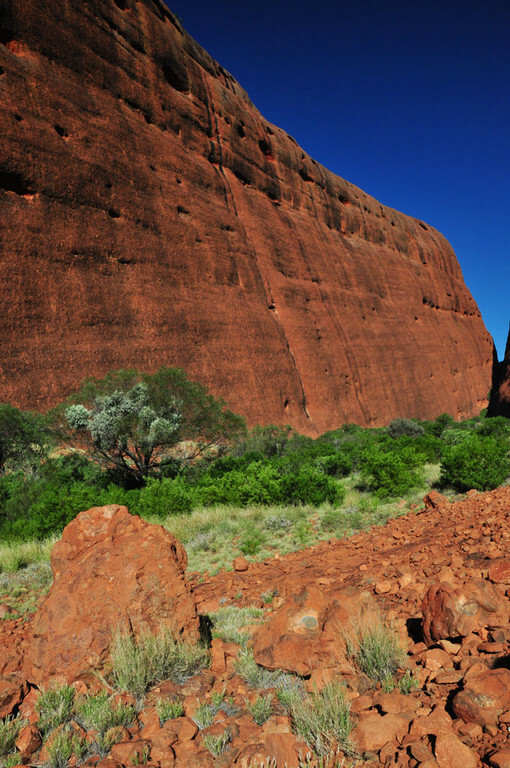 For millennia, the Anangu were nomads who travelled in autonomous groups for much of the year. They travelled light: a spear-thrower also doubled as a coal-carrier, while larger items like eating utensils were simply left behind with the assumption that replacements would be found at the next resting point, or made and left behind for the next group. 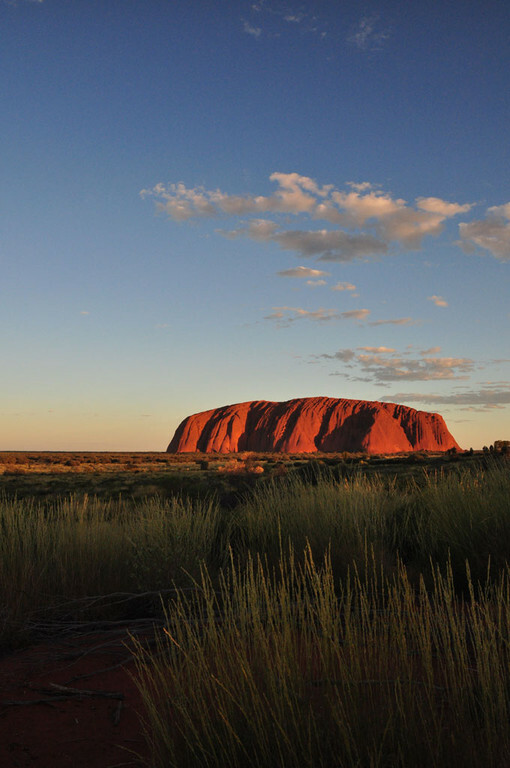 Uluru itself served as a signpost: Many of the cave paintings depict not only traditions and stories, but also offer landmarks and key points, and indicate resource levels for careful management. 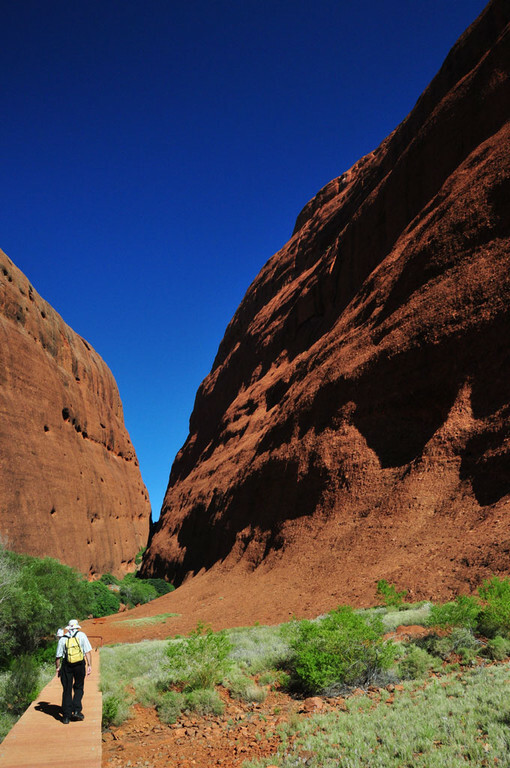 Anangu belief is defined by Tjukurpa (which the guides pronounced “CHUku-pa”), which outlines not only their Creation Time stories, but also ecological rules and societal norms. 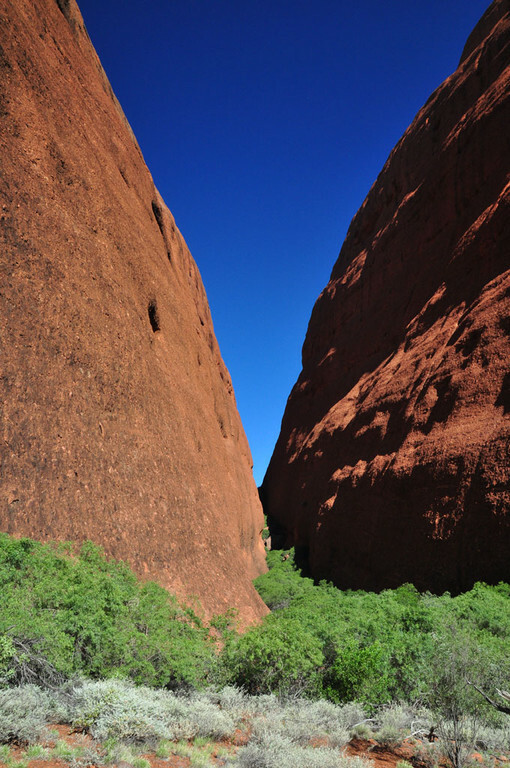 The roles of men and women are clearly defined, with some areas of Uluru being unfit for viewing by men, while all of Kata Tjuta is a male site so sacred that the names of its tjukuritja cannot be shared with the uninitiated. 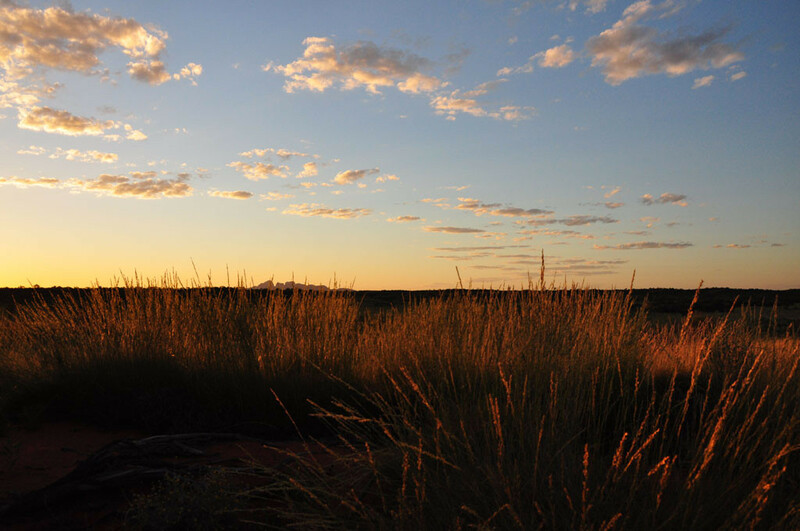 Tjukurpa outlines a deep and enduring symbiosis with the land, with laws of hunting and harvesting based on a fundamental awareness that any imbalance is bad for everyone. 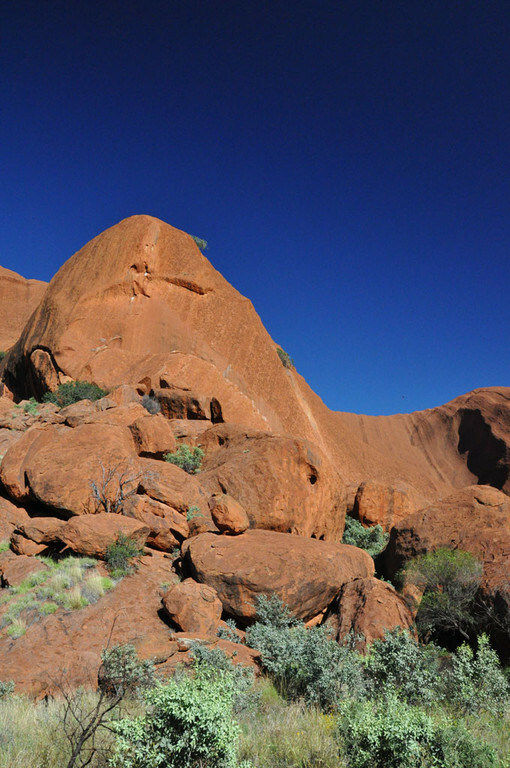 For example, if you hunt kangaroos at a water hole, you have to kill only the last one as it leaves. If you kill the first one, the others will not come back, the mob will die out, and you will have no food in the future. 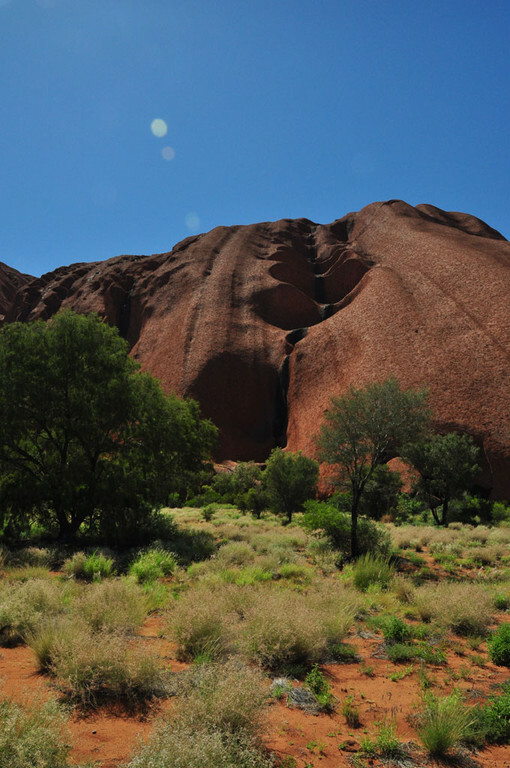 Uluru-Kata Tjuta National Park was returned to the Anangu in part because their technique of firestick farming—selectively burning patches of plant life to promote new growth—has been found to be demonstrably superior to any Western techniques for managing the land, having been developed and passed down unerringly over twenty millennia. 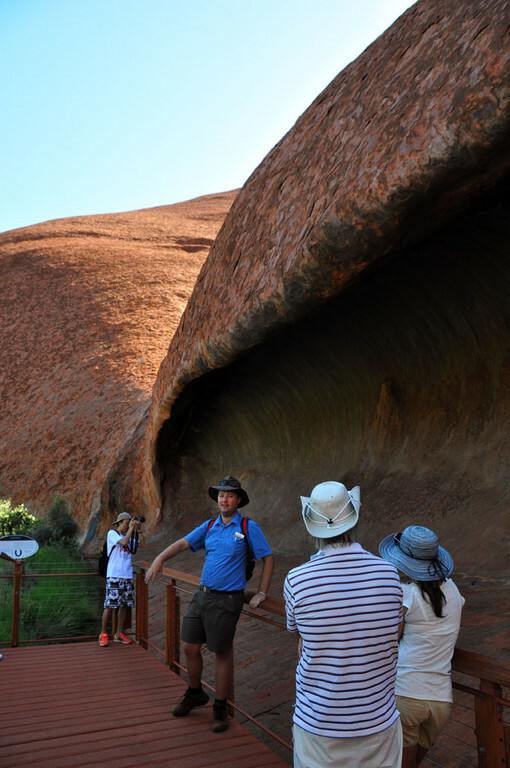 According to one of our guides, morality and punishment are based on a concept called naputji-naputji. I can find no authoritative reference to this online, but I’ve seen it translated as “what’s mine is yours”, though the explanation I received also indicated a corollary into “shared suffering” and “return in kind”. 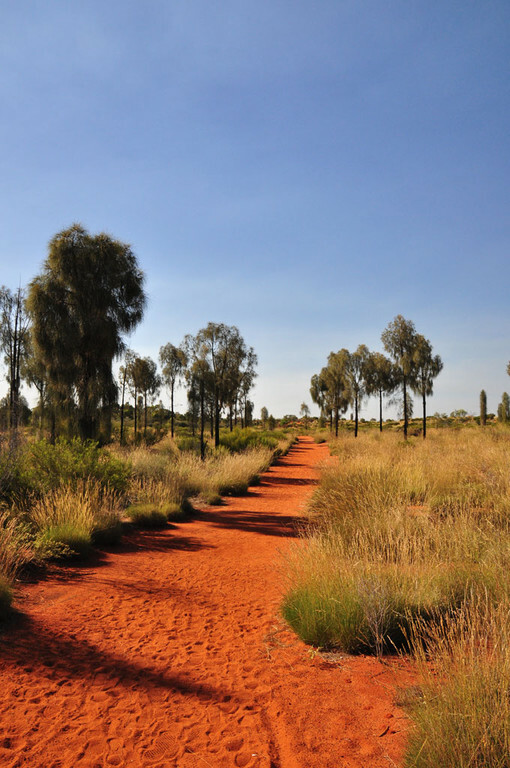 For example, if a man breaks Tjukurpa, a common punishment is to be stabbed in the thigh—because as a hunter, the ability to run is his greatest asset. 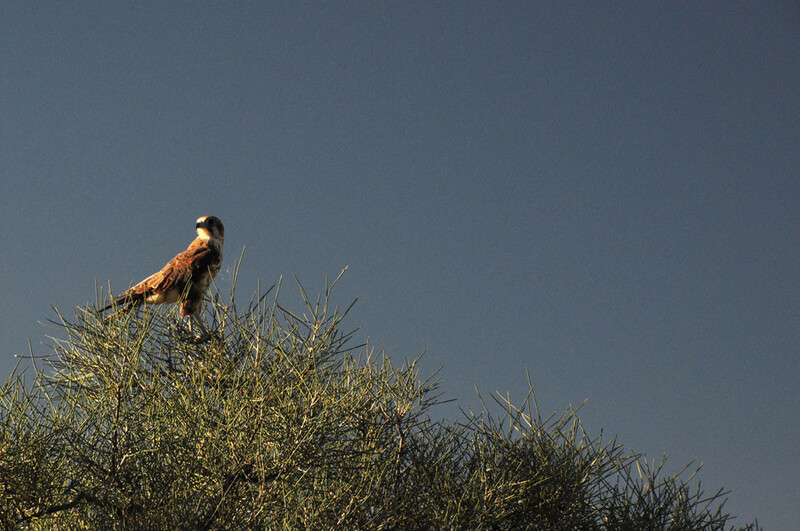 However, the punishment is also a self-punishment upon the group, as they now have to work harder since one of their hunters is wounded. And yet, once the punishment is administered, all is forgotten. 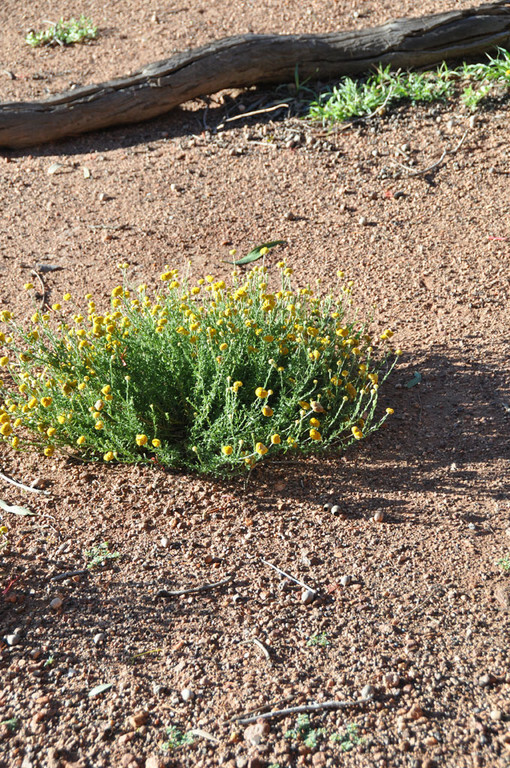 Similarly, a woman who breaks Tjukurpa might be struck on the shoulder—in this case, because she needs her shoulder to dig. Again, the loss of productivity is borne by the group without further animosity. 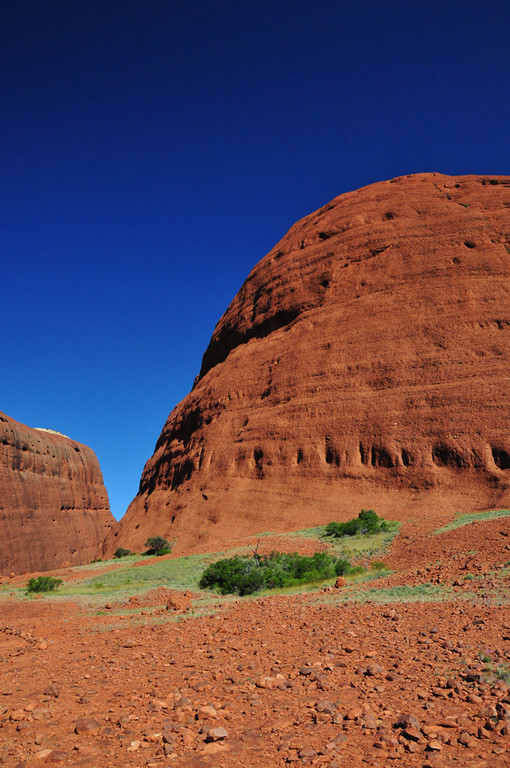 One very interesting facet of the national park is the voice of its writing. 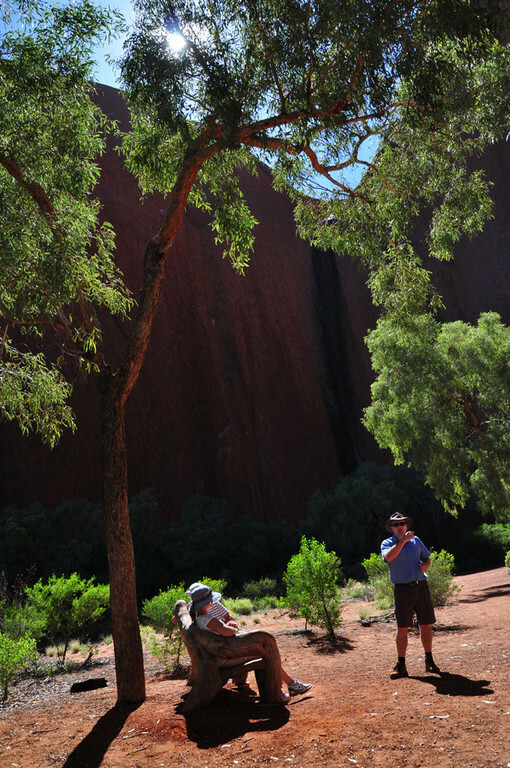 While many heritage sites describe local beliefs in a textbook tone, at Uluru-Kata Tjuta National Park, the signs are all notifications from your Anangu hosts to their less knowledgeable visitors. 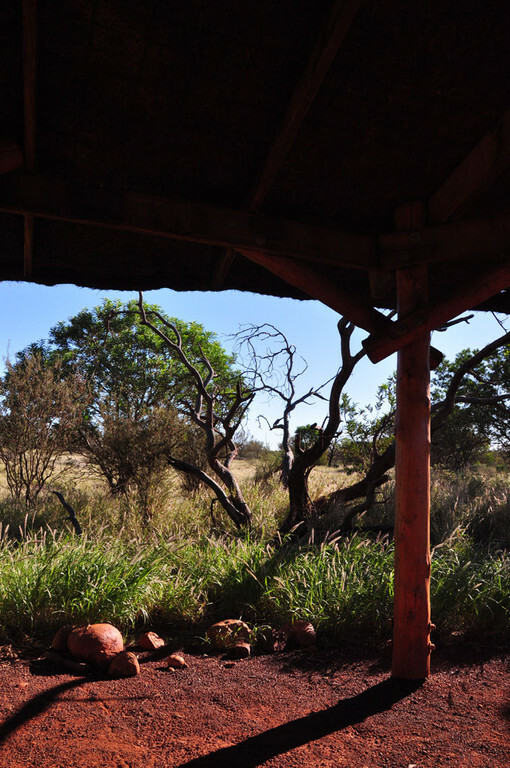 The writing conveys a distinct sense that a patient 22,000-year-old culture is magnanimously indulging its young, curious, and impulsive guests. 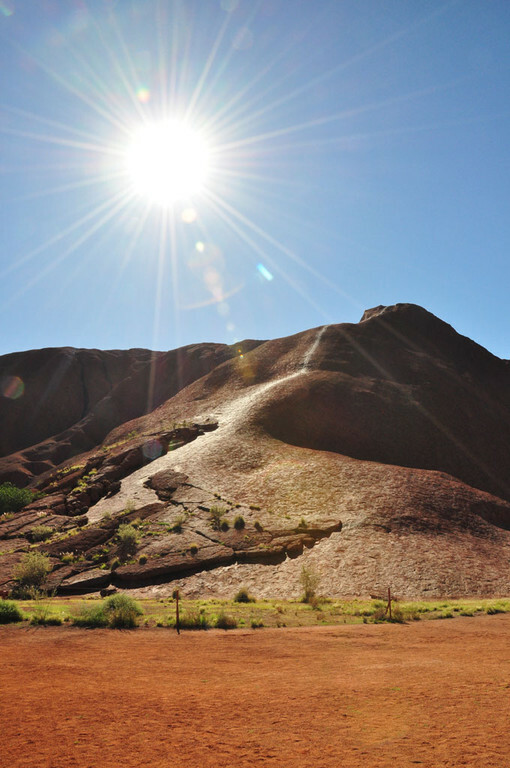 What visitors call ‘the climb’ is the traditional route taken by ancestral Mala men upon their arrival at Uluru in the creation time. It has great spiritual significance. 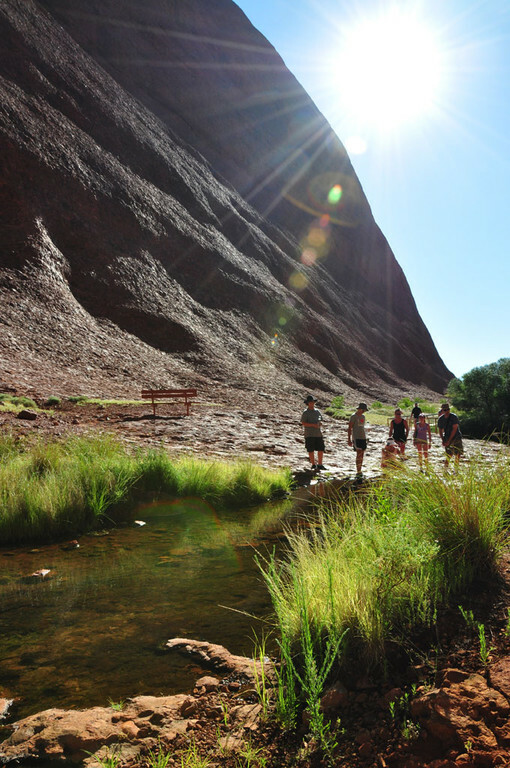 We have a responsibility to teach and safeguard visitors to our land. 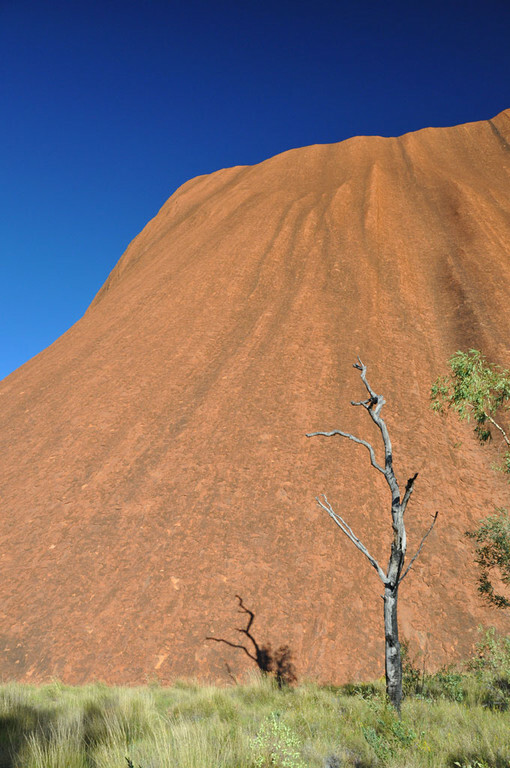 ‘The climb' is dangerous and too many people have died while attempting to climb Uluru. Many others have been injured while climbing. 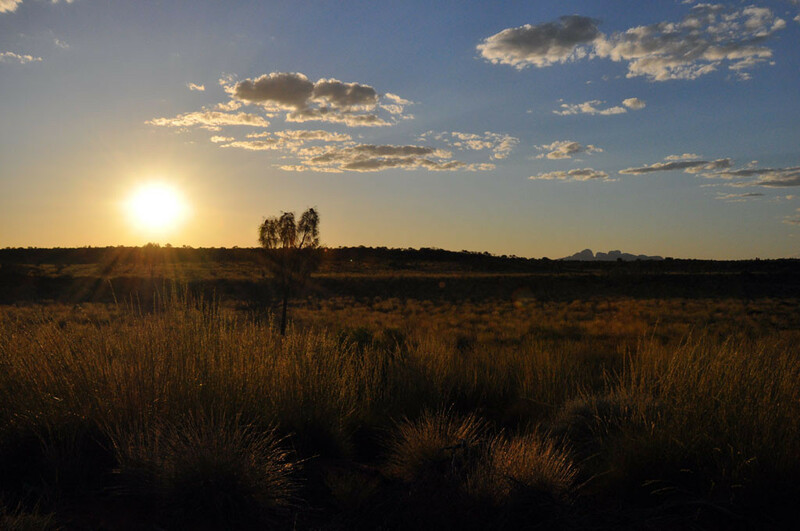 We feel great sadness when a person dies or is hurt on our land. We worry about you and we worry about your family. This is the sign at the base of the climb. And yes, 35 people have died climbing it, mostly due to heart attacks. Prior to arrival I had been debating whether to do it, at first thinking “It’s just a rock”, but gradually asking myself, “Would I rappel up the Kaaba in Mecca?" 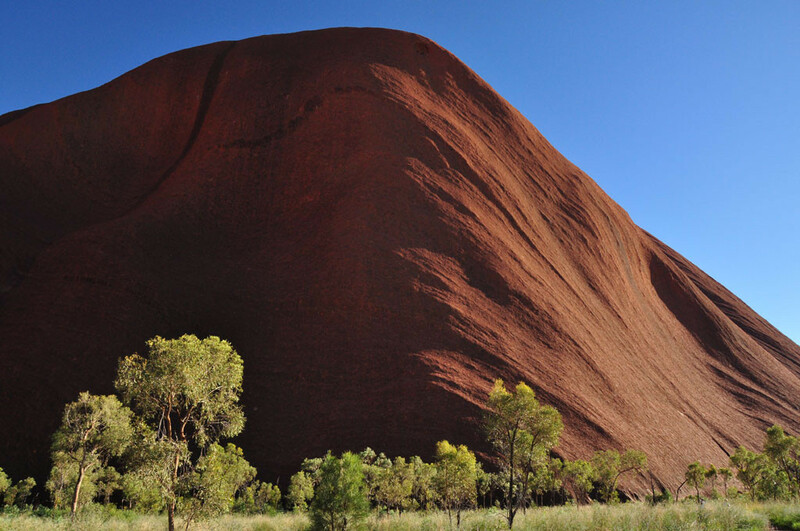 The more you learn about it, the more you realize that, to the Anangu, Uluru is the equivalent to the altar of a church, the top of which is only seen by the initiated. 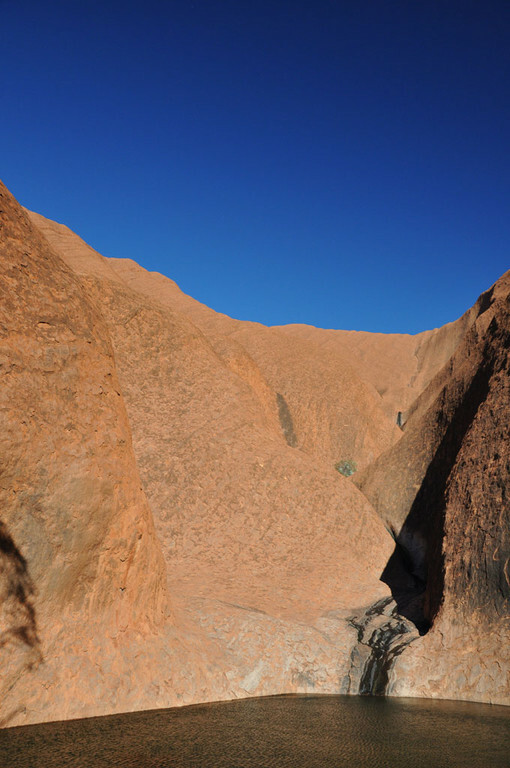 In any event, it turned out to be a moot point—while it is clearly stated online that the climb is closed when the temperature rises above 36 degrees, what they neglect to mention is that, throughout the summer season, it is assumed to be 36 degrees every day, and you can only climb in the winter. 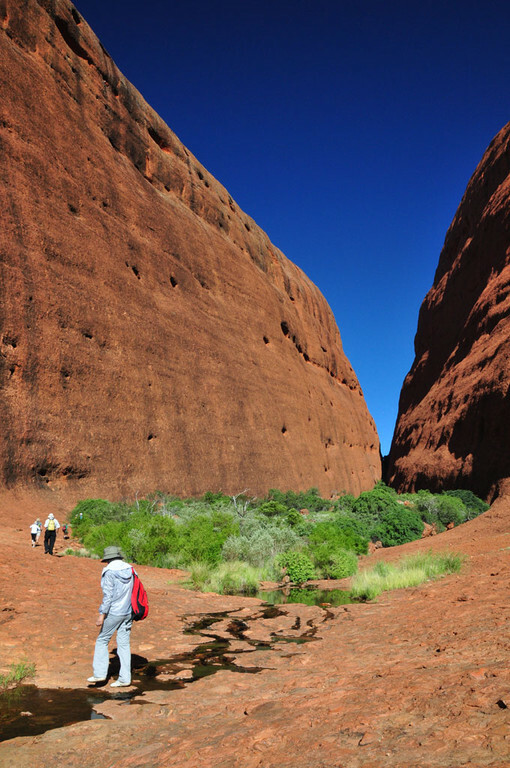 We took a brief jaunt through Walpa Gorge, the shorter of two trails in Kata Tjuta. This was the only mid-afternoon activity we engaged in, and though it was just a half-hour trek straight in and straight out, we came out of it baked like eggs on a summer sidewalk. The next day I noticed that the heel was coming off my hiking boot. I think the glue actually melted; I once had the same thing happen in Thailand. 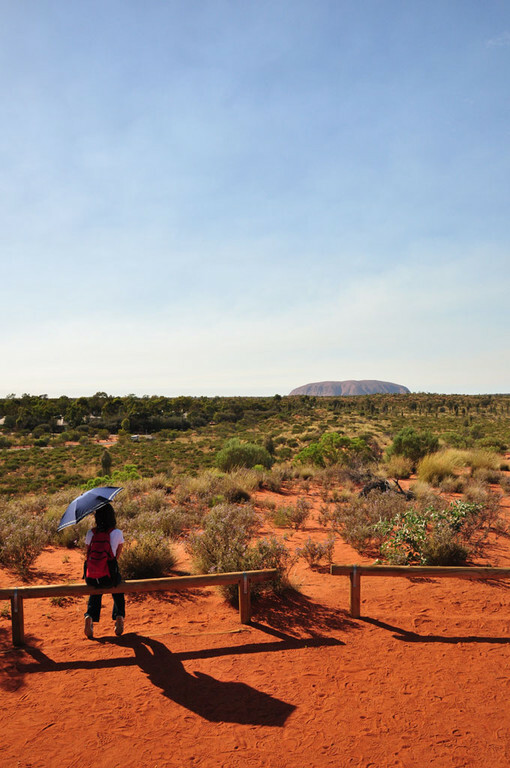 And yet, according to the guides, the preceding days of rain had actually dropped temperatures about ten degrees—and Uluru has actually received double its usual rainfall over the last two years. 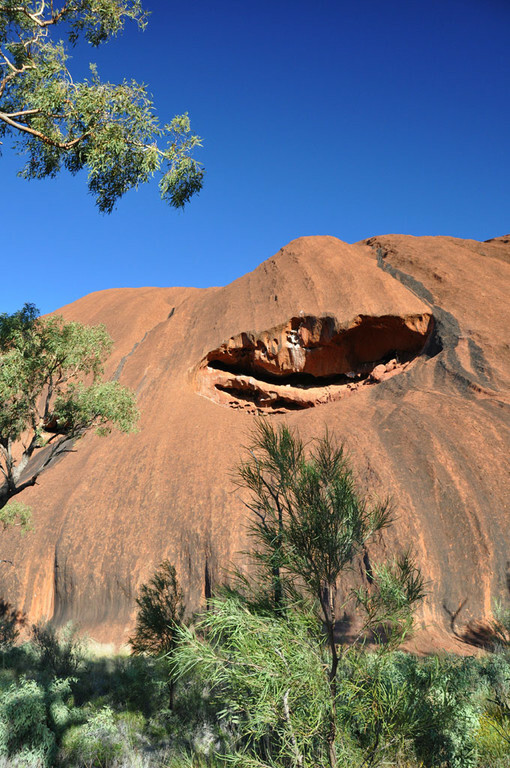 This, combined with the agonizing athlete’s foot I suffered from over the ensuing weeks, made me wonder if I shouldn’t have taken such a lingering glance at a women-only sacred site at Uluru. Ein ganz toller und informativer Artikel. Vielen Dank an dieser Stelle. Auch die Bilder dazu sind mehr als gelungen. no table, and an air conditioner blasting sub-zero temperatures even at the weakest setting.